Scholars of hadith1, Qur’an commentators, and all of Islamic tradition take this particular verse seriously and consider the Sacred Mosque to be in Mecca and the Farthest Mosque to be in Jerusalem. No Muslim scholar challenged this position throughout the Islamic intellectual history which expands for more than fourteen centuries. The parameters of this blessed land go beyond what is between the Jordan River and the Mediterranean. Ibn Kathir (d. 774 AH/1373 CE), a medieval Muslim scholar, reported the commentary of several early Muslim scholars on verse 21: 71. According to the famous Ubayy Ibn Ka`b, the blessed land is Al-Sham [i.e. Greater Syria, which includes Jerusalem]. The great early commentator, Qatadah, adopted the same position.2A more detailed account of the Night Journey and the Ascension [Al-Isra’ and Al-Mi`raj] and their relation to Jerusalem will follow. This verse is read in two very different ways, each one arriving at a very different meaning. The first way as shown above divides the verse into two parts, the first of which ends after “years”. This way of dividing the verse indicates that the Children of Israel were forbidden to enter the Land temporarily because of their disobedience. The second reading also divides the verse into two parts, the first of which ends after “reach”. Some scholars interpreted this way of dividing the verse to mean that the Children of Israel were forbidden to enter the Land in an absolute sense, again as a result of their disobedience. I am personally inclined toward the first reading, which considers the prohibition temporarily, and the entry to the Holy Land conditional. According to these verses, right relationship with God, which means submission to His will, is the absolute criterion for inheritance of the Land. Of critical importance to the Qur’an is the fact that genetic or biological decent is never sufficient in itself to merit such inheritance. It is a non-factor in this respect. * The Qur’an uses “Torah”, “Psalms”, and “Gospel” (Arabic: Tawrah, Zabur, and Injil) in reference to the original revealed books. The Qur’an considers these previous revealed books are different from those that exist today, because they suffered from human edition. The hadith shows that it is the religious duty of Muslims all over the world to maintain Al-Aqsa Mosque both physically and spiritually. The relationship with Al-Aqsa Mosque is primarily fulfilled through acts of worship, but the physical maintenance of the Mosque is also part of the responsibility of all Muslims. The fulfillment of both duties will be impaired as long as Al-Aqsa Mosque remains under occupation! The truth of the matter is that under Israeli occupation, Muslims do not have free access to the Mosque. Those who are prevented from having freedom of worship at Al-Aqsa Mosque include, but not restricted to, all Palestinians from the Gaza Strip, the West Bank, and occasional restrictions to Jerusalemite men younger than 45 years of age. Since the miraculous Night Journey of Prophet Muhammad (Peace be upon him), al-Isra’ wa al-Mi`raj, took place more than fourteen centuries ago, Muslims have established a sublime and perpetual relationship with Al-Aqsa Mosque. The Prophet was taken from Al-Masjid Al-Haram in Mecca to Al-Masjid Al-Aqsa in Jerusalem. This eventmarked a twining relation between the two mosques. The beginning of Surah Al-Isra’ (17:1) reminds Muslims and non-Muslims of this important event. When the Prophet (Peace be upon him) reported the event to the people of Mecca, they challenged him to prove it by describing Jerusalem to them, because they were familiar with it through their caravan trading. They used this story to undermine his credibility as a prophet; they knew that the journey from Mecca to Jerusalem would take several weeks during that time in each direction. They were considering Prophet Muhammad’s abilities, not that of the Omnipotent God! There are many references to this event in the Qur’an and the traditions of the Prophet (Peace be upon him), to the extent that it is not possible to cover all the details of the Isra’ and the Mi`raj in such an article. The basic story is that Prophet Muhammad (Peace be upon him) was taken by the archangel Gabriel on a supernatural animal (Al-Buraq), from Mecca to Jerusalem and then to heaven, where he received the commandment for the five daily prayers. On his way back, the rout of the journey passed through Jerusalem and there he led the other prophets in prayer. The part of the journey from Mecca to Jerusalem is called Isra’ and the ascension to heaven is called Mi`raj. The journey took place during what is described as the Year of Sorrow (`Am Al-Huzn). It was during this year that the Prophet (Peace be upon him) lost two of his most important supporters: his wife Khadijah and his uncle, Abu Talib, who despite the fact that he never embraced Islam defended his nephew against the powerful tribes of Mecca. This hadith provides the setting for interpreting verse 17:1, and explains why Muslims believe that the “Farthest Mosque” is in Jerusalem. The twinning relationship manifests itself in the fact that another term “the Sanctuary” or Al-Haram also refers to Al-Aqsa Mosque, deriving from the name “the Noble Sanctuary” or Al-Masjid Al-Haram in Mecca. 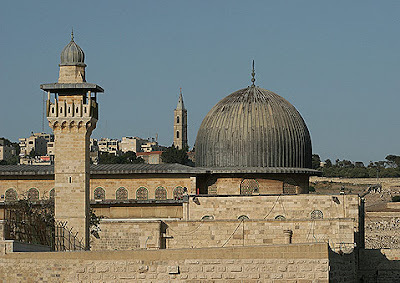 The reference to Al-Aqsa Mosque as “Haram” is a cultural development that reflects the very close relationship between the two mosques in Islamic consciousness. In other words, strictly speaking from an Islamic fiqh point of view, the laws that apply to the Haram in Mecca, such as the prohibition of hunting during the time of Hajj, do not apply to Al-Aqsa Mosque. The paragraph that preceded the definition of Al-Aqsa Mosque was dedicated to its measurement. Twice, the measurements of the Mosque were taken under the supervision of Al-Hanbali to make sure that they were accurate. He mentioned that the length of the Mosque was measured from the southern wall to the northern corridor near Bab Al-Asbat (i.e. Lions’ Gate), and the width was measured from the wall overlooking the cemetery of Bab Al-Rahmah (i.e. Golden Gate) to the western corridor, beneath the Tankaziyyah School. In both cases, the width of the walls themselves was excluded. It should be noted that the Qur’anic reference to the Al-Aqsa Mosque, as a mosque, took place years before the actual arrival of Muslims to Jerusalem. It means that part of what the Muslim believes is that Al-Aqsa Mosque was designated as a mosque by God. The Qur’an teaches that, while a single system of ethics and belief should be common to the revelations and Scriptures of all peoples, the specific laws of ritual and behavior [i.e. Shari`ah] may vary among peoples and religions. “…the people of the Book know that that is Truth from their Lord”. Al-Aqsa Mosque was developed and the buildings expanded on a large scale during the reign of the two seventh and eighth century Umayyad Caliphs, Abd Al-Malik Ibn Marwan and his son Al-Walid to the extent that it surpassed the architectural grandeur of all mosques. The magnificence of the architecture of the Dome of the Rock and the southern most building within the parameters of Al-Aqsa Mosque is witness to the importance of these holy sites in Islam. Another chapter of the Qur’an is written on the outside of the Dome of the Rock. Like a crown, chapter 36 (i.e. YaSeen) covers the upper most part of the octagonal walls. There are several prophetic traditions of various strengths about the virtues of this chapter of the Qur’an. One of them, categorized as having a “weak” chain of narrators, considers it the “heart of the Qur’an”.13YaSeen does begin with confirming the messengership of Prophet Muhammad, but then it moves to other topics including life, death and resurrection. 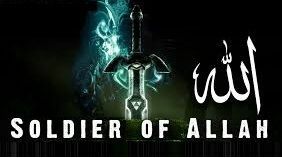 [Remember] when the wife of 'Imran said: My Lord! I have vowed unto Thee that which is in my belly as a consecrated [offering]. Accept it from me. Lo! Thou, only Thou, art the Hearer, the Knower! Ibn Kathir interpreted the statement of Mary’s mother “the male is not as the female” as in “strength, perseverance in worship and in serving Al-Aqsa Mosque” Chapter 20 (i.e. Ta-Ha) is written on the neck of the Dome of the Rock on the inside. It reflects certain similarities with chapter 17 which is written on the outside; both chapters “begin” with Prophet Muhammad and move to Prophet Moses. The Qur’an narrates, in the case of the latter, some essential stories about him including receiving revelation, his struggle against the Pharaoh, liberating the Children of Israel from servitude, the story of the golden calf, splitting the sea, and more. There is an addendum to the previous Hadith stating that Um Hakim daughter of Umayyah Ibn Al-Akhnas, who reported the Hadith of Um Salamah, traveled from Medina all the way to Al-Aqsa Mosque and initiated the minor Hajj from there. There are many other traditions that reflect the importance of Jerusalem and AlAqsa Mosque in Islam that for brevity I did not include in this article. Yet, to conclude, I would like to refer to `Umar Ibn Al-Khattab once more. After entering the city, the Bishop of Jerusalem invited him to pray inside the Holy Sepulcher church. `Umar declined politely and stepped outside the church to pray. This act, I believe, established a practical module for interfaith relationship, especially in relation to the religious space of the other. The sacredness of the Holy Land does not mean that spirituality could only be achieved in such places. In a tradition narrated in Imam Malik’s greatly respected hadith collection known as Al-Muwatta’, two prominent companions of the prophet had the following exchange of letters regarding Jerusalem: Abu Darda’ invited Salman Al-Farisi to come to Bayt Al-Maqdis (literally, the House of the Sanctified). Salman replied by saying that the land cannot sanctify anyone. Only one’s good deeds may bring one true sanctity. 1A hadith is a tradition of Prophet Muhammad. When the message that the hadith contains forms part of the Islamic worldview, it is described as Sunnah, or way of the Prophet. The Sunnah constitutes, after the Qur’an, the second source of Islamic law, Shari`ah. 3Ibn Kathir, vol. 3, p. 512. 4Sayyed Qutub, Fi Zilaal Al-Qur’an , 12th edition (Beirut: Dar Al-Shuruq, 1986) vol. 2, p. 871. 5Ibn Kathir, vol. 3, p. 3. 7Hijr Isma’il, an area considered to be part of the Ka`bah but ended up outside it when it was rebuilt before Muhammad (Peace be upon him) became a prophet. 8Mujir Al-Din Al-Hanbali, Al-Uns Al-Jalil fo Tarikh Al-Quds wal-Khalil (Beirut: Dar Al-Jil, 1973) vol.2, p.11. 11 Abu Dawud, Sunan # 10; Ibn Majah, Sunan # 319; Ahmad Ibn Hanbal, Musnad # 4/210. 12 Al-Nawawi, Sahih Muslim bi-Sharh Al-Nawawi (Commentary on Hadith # 2475). 14Ahmad Ibn Hanbal, Musnad # 25347. Today, there have been 99 visitors (174 hits) on this page!